There’s lots happening here…but it’s oh-so-easy and oh-so-make-ahead. 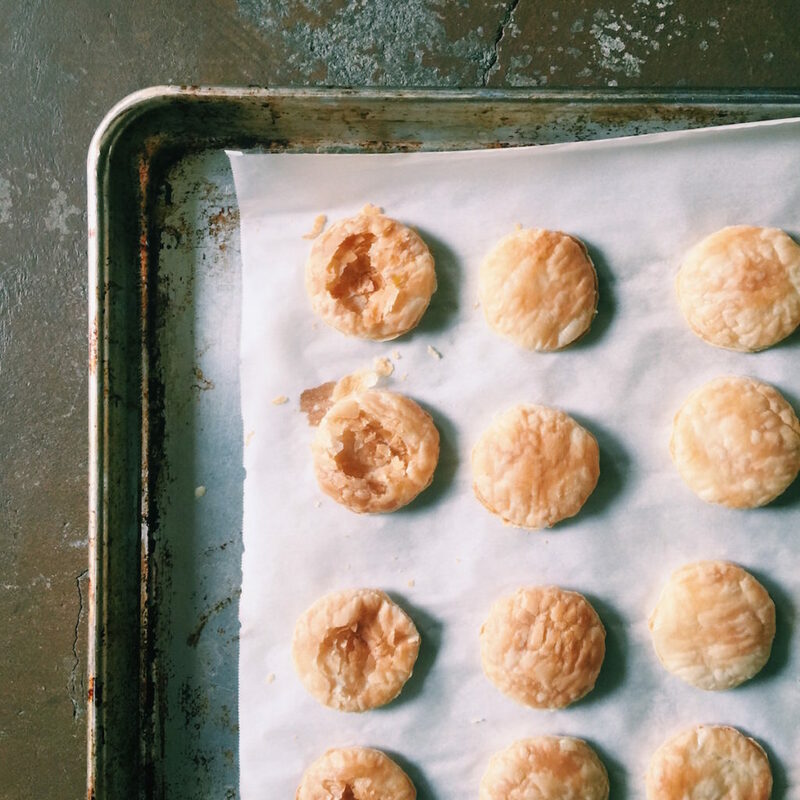 We start out with some thawed puff pastry (easy enough)…we give them a quick blast in the oven to puff them up a bit. Then, using a spoon (or fork or other device) we press down in the centers to make a bit of a valley to which we shove all types of deliciousness. For these, I put four types of cheeses that are bursting with personality, a smattering of caramelized onions (because L O V E) and then another quick burst in the oven. Upon their exit, they get a dollop of sautéed shiitake mushrooms and a sprinkling of thyme. Oh, and lest we forget the drizzle of truffle honey. Never forget the truffle honey. 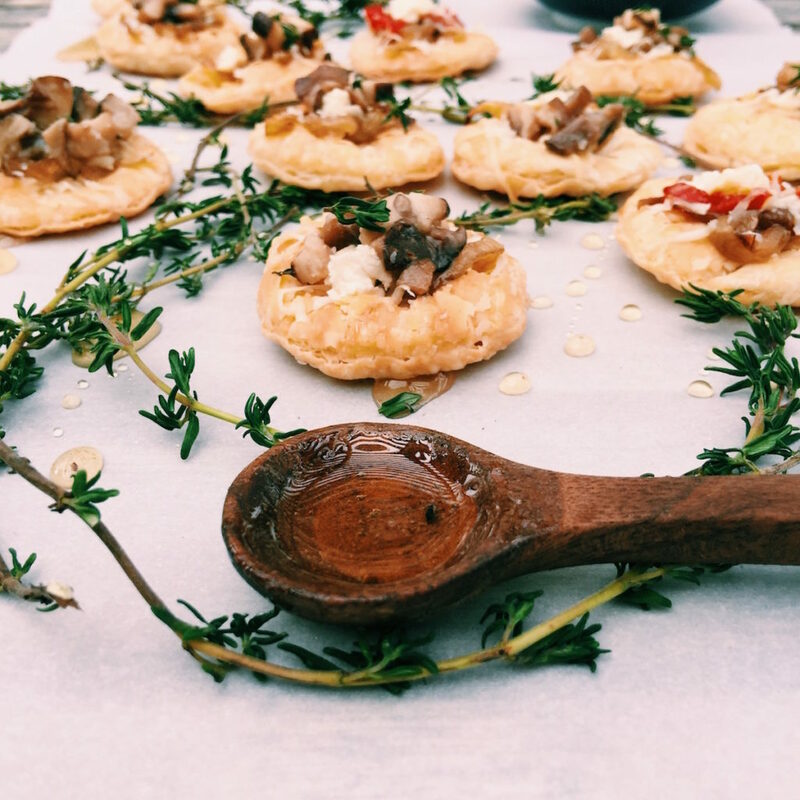 These caramelized onion tarts are a totally flexible app because you can switch up the cheeses, omit the mushrooms, add sweet-hot peppers…whatever strikes your fancy. And best yet? You can make these the day ahead and then give another quick burst in the oven before serving to freshen them up a bit. I have all the make-ahead notes in the instructions below. This is it, people. I’ve given you my full Christmas Eve dinner with make-ahead tips galore (galore is a totally underused word, by the way). So below, I have the full menu with links, I also have your prep schedule. If you’re just getting started don’t fret. Just reallocate Monday’s prep throughout the week. You got this. In regards to PIZZA, I did not do an extra post…my beer crust pizza is always the same (get the recipe here and here) and you’ll find pizza inspiration on both of those pages as well. Also check out the feedfeed’s Pizza Feed for ideas. Get creative, get crafty and make it your own. Please tag me with #DisplacedHousewife on social media if you make any of this and MOST IMPORTANTLY: Have a wonderful holiday if I don’t speak with you sooner. Love and happiness and peace. Here are some recipes + ideas (here and here). These don’t need anymore details…it’s just…heaven. *If you don’t have marsala handy (and don’t want to purchase), you could sub in sherry or just omit. I do like to keep marsala on hand for when I make gravy and it’s delicious with chicken. Just a thought. 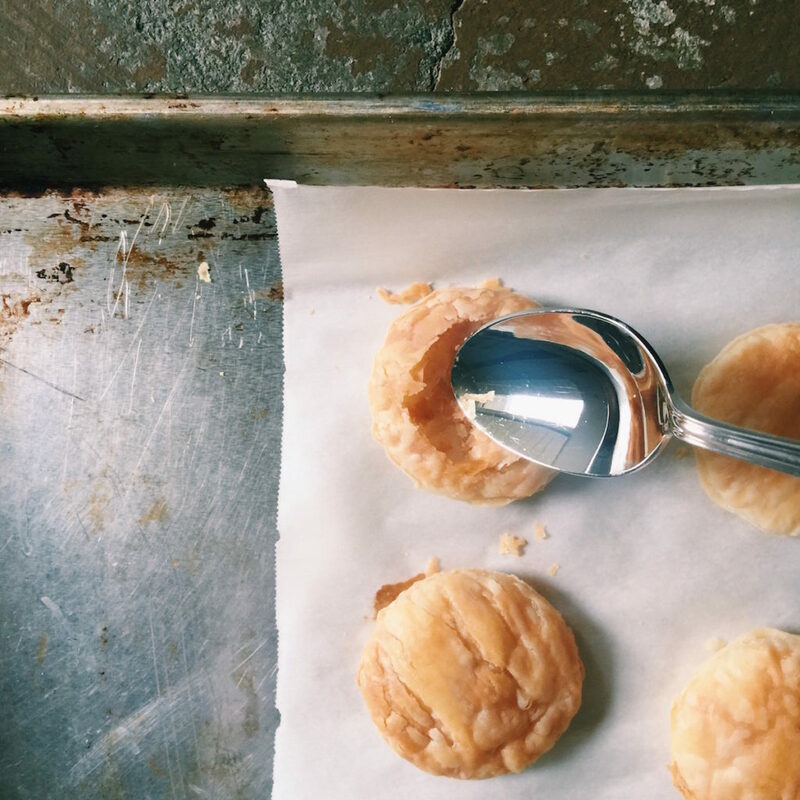 Set your puff pastry on the counter top to come to room temp. You want it to defrost just to the point that you can roll it out a bit, but not so defrosted that it’s warm…it’s a fine line. Meanwhile, caramelize your onions: 1) peel and thinly slice your onion 2) melt the 2 tablespoons of butter and 1 tablespoon of olive oil in a medium skillet over medium-low heat and then add your onions. Sauté for 20ish minutes until nice and golden. Add a pinch of salt and set aside. At the same time as the onions are cooking, melt 1 tablespoon of butter in a small skillet over medium heat. Add your chopped mushrooms and sauté until softened. Should take just a couple of minutes. Add a pinch of salt, a splash of marsala and they’re done. Set aside and keep warm. 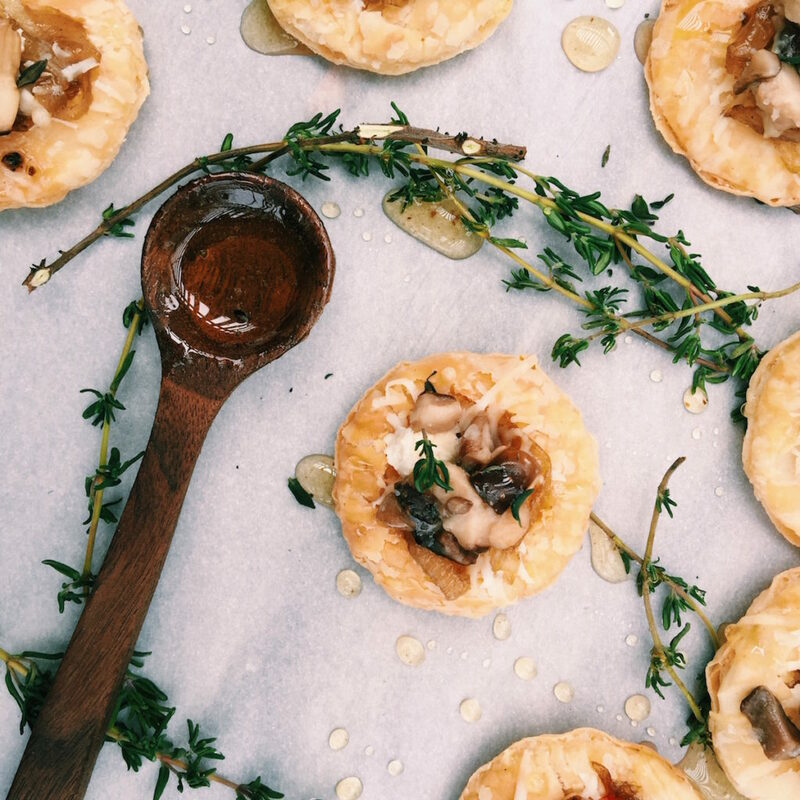 If you’re serving these the following day, seal the mushrooms in a container and stash in the fridge…you’ll want to warm them up a bit before topping the petite tarts. Make sure a rack is in the middle of the oven. Lightly flour a cutting board or other clean surface. Grab a rolling pin and lightly dust it with flour as well. Set the puff pastry on top. Roll it just about 1 inch larger then it is to start…you don’t want to get it too thin. Cut 16 small rounds out of the puff pastry. I used the open end of a shot glass to cut out a nice small, round tart. Perfect app size. Set the tart rounds on the parchment covered baking sheet. Put the baking sheet in the oven and bake for 10 minutes, until puffed and golden. Pull out of the oven and push down in the center (I used a spoon for this), leaving a little pit of a puffed crust on the outside. Put ½ teaspoon each gruyere and cheddar in the center of each tart…then put a dollop of caramelized onions (and/or sweet hot peppers or whatever you’re feeling at the moment) and then add a sprinkling each of parm and feta. Put the tarts back in the oven and bake for another 6-8 minutes or until the cheese is nice and melted. **Make ahead: you can let them cool and then wrap tightly in plastic wrap and then foil and stash in the fridge for the night. When you are close to serving, pop them out of the fridge and into the oven for a couple of minutes to heat them up again and proceed with the instructions. Once out of the oven, put a mound of warm mushrooms in the middle, a sprinkle of chopped thyme and a drizzle of honey. These would go perfect with a cocktail (obvi) or champagne…are you feeling that? 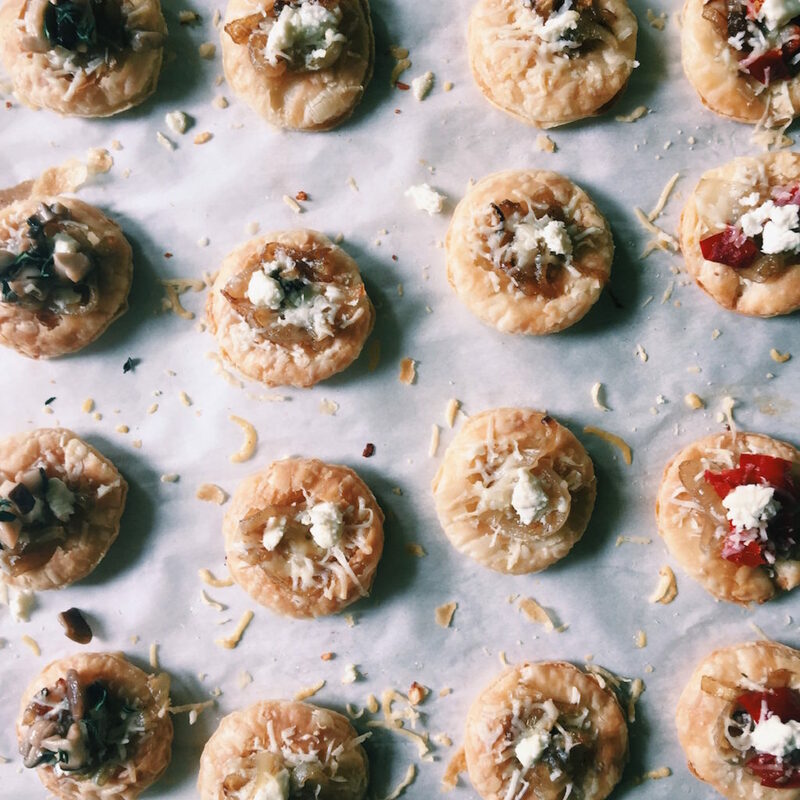 I also like to throw out nuts, olives and bread sticks with these caramelized onion tarts…gotta keep a good base going for our cocktail game. I have another post in mind prior to Christmas…but honestly, the pull of sloth, gluttony, avarice and any other sin you can think of is pretty strong right now. I will try my hardest. A bit of a tart side note: I have served these as a vegetarian dinner option…I cut 1 puff pastry sheet into six rectangles and used the same instructions as above. Delicious. Just a thought. Can’t wait to make the tarts. I’ll make anything that is do ahead. Thank you Displaced!